Olympia is the site of the ancient Olympic Games, which were celebrated every four years by the ancient Greeks. The area, of great natural beauty, was attacked by the recent fires and the vegetation on the holy Cronius Hill next to the archaeological site was burnt but, as the Greek Culture Minister told the Associated Press at the site "the important thing is that the museum is as it was and the archaeological site will not have any problem." Olympia has been inhabited uninterruptedly since the 3rd millenium B.C., and in the late Mycenaean period it became a religious center. 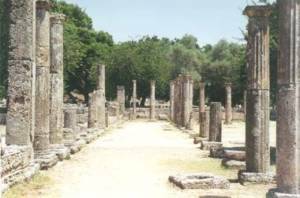 Olympia was situated in a valley in Elis, in western Peloponnese (Peloponnesus), through which runs the Alphios River. It was not a town, but only a sanctuary with buildings associated with the games and the worship of the gods. The Amalia Hotel, Olympia, is situated in an idyllic setting of gardens and mature trees, not far from the archaeological sites of Olympia. The hotel New Olympia is friendly and comfortable hotel, with a traditional family atmosphere. In the traditional style of the region, the hotel has an old-fashioned feel to it, much like going into someone's home.